Let's face it January is a pretty depressing month for most of us, Christmas is over and everyday at the moment is dull, grey and rainy. Things get a little better for me in February as it's my birthday, Valentines's Day and my wedding anniversary but I'm still left craving the onset of Spring. I don't know what it is that I love so much about Spring, maybe it's the cheery yellow of the daffodils, the pretty pinks of the blossom on the trees, the beautiful lambs in the fields surrounding our home or the promise of some sunshine and lighter nights, every part of Spring appeals to me. One way I like to make it feel more like Spring in my home at the moment is to fill my house with flowers, the thing that set me off on this was a Christmas gift from a client of mine, she gave me a gift set that included a plant pot, compost and Paperwhite bulbs. I planted them straight away, popped them on my window sill and within a couple of weeks they'd shot up and produced the most beautiful white flowers. I loved them so much and they made the house seem so much more cheerful and pretty that I decided from that point on that I would surround myself with plants and flowers where ever I could. I picked up some bargain Hyacinths at Morrisons for around £1 and then got a pretty planter from the garden centre, again for £1 and as you can see from the first photo on this post it looks great all for the grand total of £2, so don't be put off thinking that buying flowers and plants will cost a lot of money. 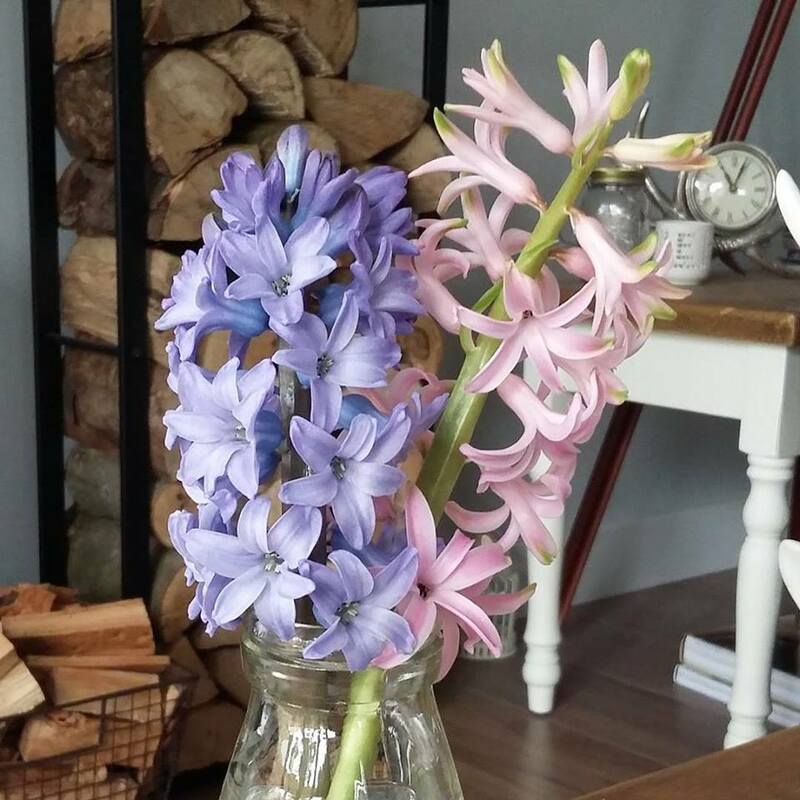 The scent that Hyacinths give out is amazing, my whole house smells great and everyone comments when they come round, the only slight annoyance with them is they tend to droop once all of the flowers have opened because of the sheer weight of the flower head but when that happens I just snip them off and pop them in a little vase/jam jar or glass milk bottle and they look beautiful. If plants aren't your thing then just buy fresh flowers, they can be expensive so to save a few pennies I always check the reduced flower section which is where I got the pink roses pictured below for just £2, there was nothing wrong with them and they lasted for a week. Other flowers that I love to buy at the moment are Tulips and Daffodils, they're readily available, really cheap and they really make it feel like Spring inside even though it's miserable outside. Love the welly vase! how fab! 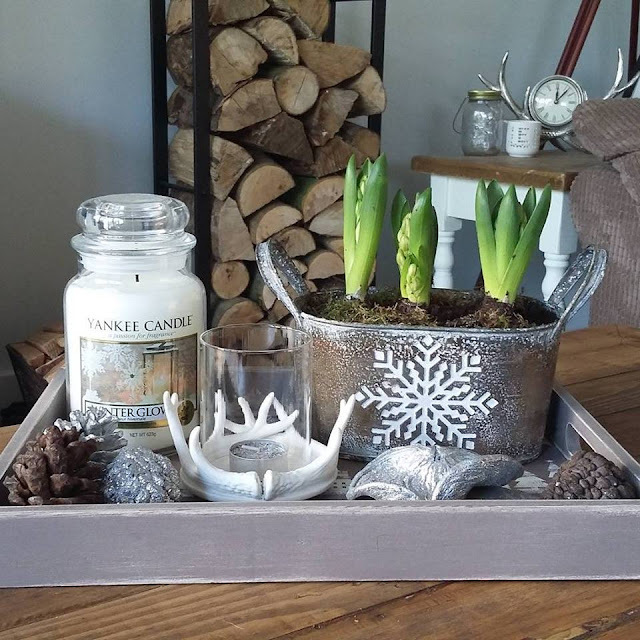 Gorgeous ideas - I do love bringing flowers into my home once the Christmas decorations come down. I have a little cute watering can that I fill with soil and plant Spring bulbs in! Love the welly idea! I really like the pink roses and red tulips! I like the wellie boot. I love flowers in winter too especially if they smell really nice! Beautiful flowers, the welly vase is fab! 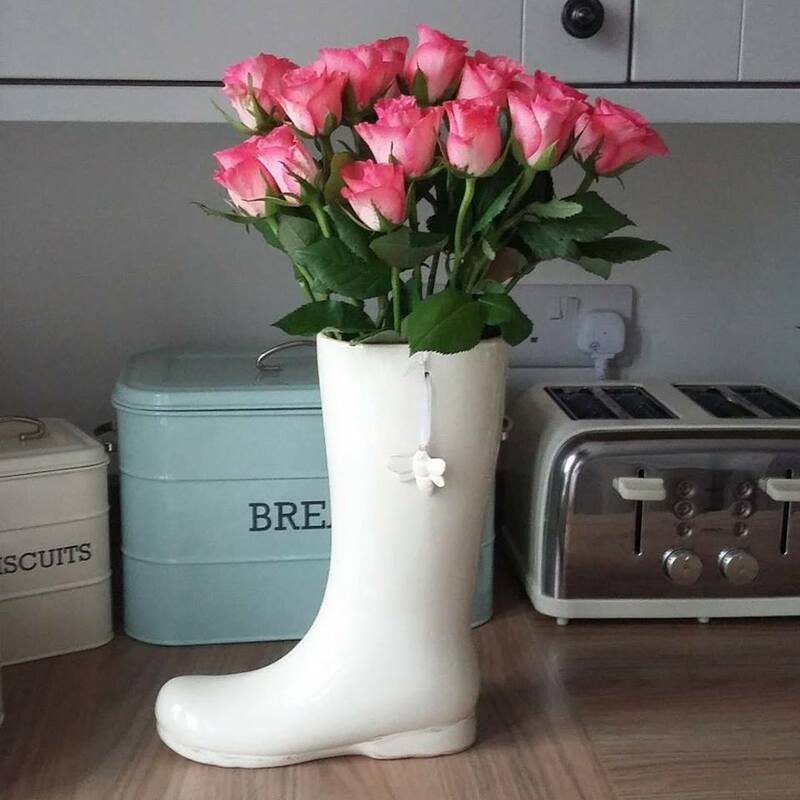 Love the roses in the welly boot! I'd forgotten how much I love flowering bulbs, maybe next year then! 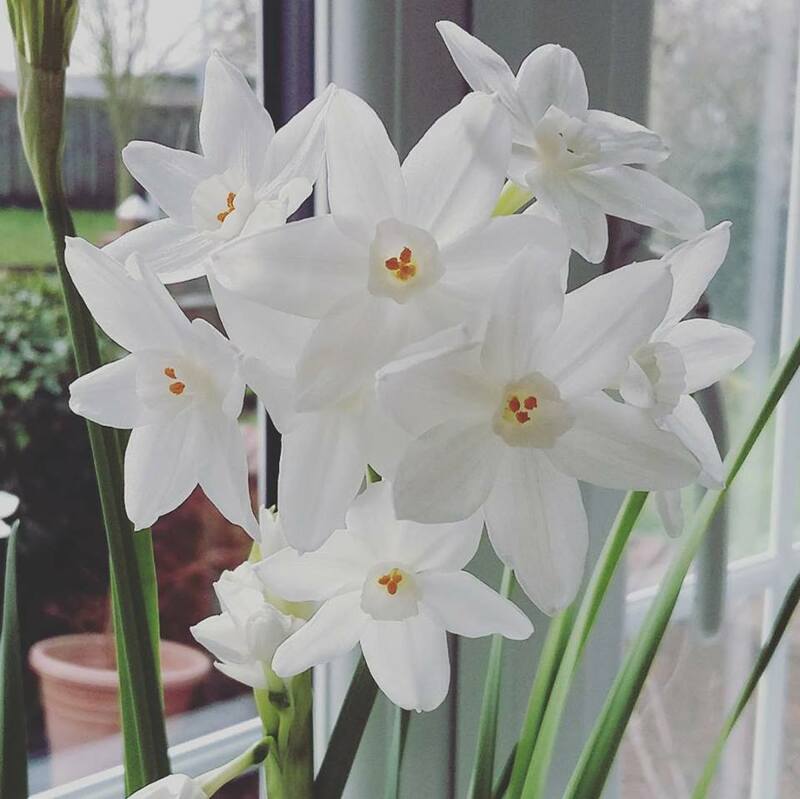 Paperwhites are lovely! I've been buying daffodils for the last couple of weeks to bring some spring in too. Flowers always do the trick! I bought some daffodils in M&S on Thursday and they were tight buds and now they are in full bloom and only cost 50p. 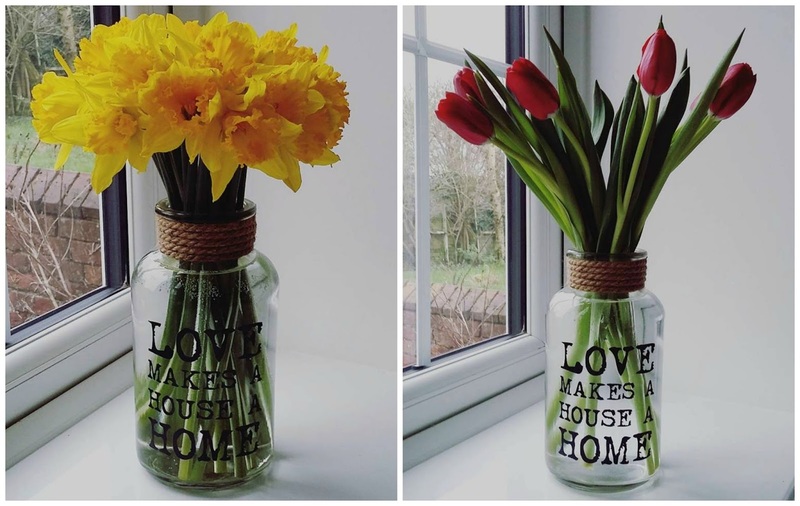 i love the jars as vases, flowers are great to brighten up the home. I love fresh flowers to really cheer me up during the long winter months! Lovely ideas and gorgeous flowers! I'm loving the fact that daffodils are so cheap at the moment. I'm filling my house with them! Bargain daffodils are always available and greeat this time of year! Roll on spring!